Guest writer Ashley Parry, who is passionate about cars and driving, found that the whole driving experience in Romania leaves a lot to be desired. He remembers the feeling he had when at a Romanian crossroad for the first time – deathtrap. But, after a while, he found himself doing the very things he was criticizing. Most will tell you that their passion was with them from a very early age. They knew, to some degree, what they enjoyed doing/watching and that is how most youngsters gain their aim in life. For me, it was rather different. In all honesty, during my childhood I didn’t like doing anything in particular. I was a normal kid that wanted to play computer games, go to the park, play some football and watch my favorite TV Show. But nothing really caught my attention and ignited that inner passion that should spur me onto adult hood, having mastered that particular area of interest. Don’t despair for me just yet! I did find my passion! It was on the day I turned 17 years old. The English amongst you (and those in the know) would have probably guessed just by the age stated, what my passion is. In a word; automobiles! Car, vehicle, ride, motor or maşină. Whatever you want to call them, they are just metal boxes with four wheels. Something seemingly uninteresting, harsh and cold in its description can take on a whole different persona. My first car was a Peugeot 106, 1.1L and it was an absolute beast! Well, at least I thought it was. I remember vividly the day I passed my driving test and took it out, for the first time, by myself. It was the weirdest feeling; where was my driving instructor? He was my safety blanket! Soon enough, this feeling of isolation and responsibility wore off and I was finally free! That afternoon after passing the test, me and my friends piled into the little 106 and drove around the area. We were kings of the world! Since that day, I have been an avid fan of Formula 1 and, of course, wanted to become a F1 driver. It was much too late and, with an team joining fee of at least GBP 10 million, my bank account wasn’t going to let me follow my passion to the highest level. So I settled with watching on TV and simply enjoying driving normal cars in everyday life. 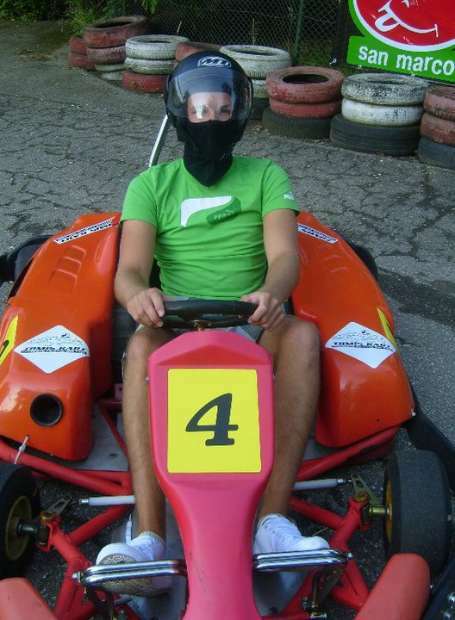 Karting is also a past time that I actively take part in and love every second of! It’s as close as I can get to that ‘track experience’ without paying ridiculous money for a Lamborghini track day or similar. Soon enough, cruising the streets of my home town began to bore me. Once you know every corner, every roundabout and every motorway, it’s time to broaden your horizons. Back in 2011, I bought an Audi A5. My dream car. 2.7 TDi. 7 gear tiptronic. Flappy paddles. I’ll be the next Lewis Hamilton yet! The amount of time, literally, I would just stand and look at that car was unreal. The lines, the aggressive front end and the low sloping roof were just some of the aesthetically pleasing aspects of my car. Within two weeks of purchasing the car, I decided a road trip was in order. My thought process was that I was doing this powerful, GT-esque vehicle an injustice by confining it to the streets of a small seaside town. At the time, I had a Latvian friend who I have, sadly, since lost contact with. He suggested we drive to Latvia, stay there for a little and came back within a few weeks. Sounded perfect. I won’t go into details about the trip apart from saying that Latvia was an experience I’ll never forget. Oh, almost forgot. The German Autobahn’s. Scarred myself silly! Definitely blew the cobwebs out of the engine. I found a way to mix my two favorite pastimes. Cars and traveling. Road trips are, in my opinion, the best way to see the world. It is true freedom. Roll into an area you like the look of? Stay as long as you like without the worry of catching that flight back home. Rising petrol prices are not helping my preferred method of transport but, for the moment, it’s still doable. Just. My next aim is to drive the French Riviera. Convertible, girl and sunshine. What more could you want? I’ll do my best to try and describe what is it about these machines that gets the emotions flowing but I imagine it will be quite difficult. Fellow ‘petrol heads’ will know what I am talking about when I say that it’s a very specific feeling when driving, as though you and the car are part of a symbiotic relationship. Cheesy and cliched, I know, but it is honestly how you can feel if you really connect with a car and get to truly know how it handles and drives. Man and machine, as one. Driving in Romania can, sometimes, leave a lot to be desired. I fear that, at the time of writing this article, I have now become accustomed to the craziness that is navigating Romania’s roads. I do, however, remember the crossroads and my first reaction them. Deathtraps. When I first took to the streets, it just wasn’t in my driving skill set to keep a watch at crossings for people dicing with death. Back home, the traffic lights would change to red and then the people could cross. I know on the main intersections here this is the case too but on most roads, you have to hover your foot over the brake and ensure you see that foot come off that sidewalk. Impatience. Wow. Stay a millisecond at the lights once they go green and an orchestra of horns will erupt, leaving you to clamber for the stick shift and get away before you’re the victim of road rage! The funny thing is, after a while here, I found myself guilty of doing the same thing. Driving can be very hypocritical. Monkey see, monkey do. Everybody just chill. From time to time, and usually late in the night, I will take myself out in the car and just drive. Drive and drive. I used to think I did this because it helped me think and, in some ways, I still think that is true. However, I believe it is more to do with the love of driving and that affection making me relaxed, centered and focused, thus allowing me to make sense of this crazy world, wake up the next morning and attack the day. Also, the simple fact that there is less traffic on the roads at that time of the night is always a positive. Not having to brake and change gears so often can be a joyful respite. I believe this passion will never leave me. I believe I’ll never grow tired of it. I believe now I understand how people can be so passionate for something while others cannot fathom what all the fuss is about. Passion is personal. It is your own unique view on an aspect of life that can bring true happiness. For me, I think passion comes naturally. On your own terms. You can’t work on it to become passionate. You either are or not. Life can be difficult at times. We all know that. However, if you have a passion for something, you’ll get a moment to escape the hardships and feel unburdened, unbridled and, well, simply free. And in my case, the adrenaline helps!